Who remembers Norumbega Park? If you do then you have a connection with this railway. Commonwealth Ave. St. Ry. built the park, then became part of the Newton Street Railway in 1903, then the M & B in 1909. The M & B sold the park in 1937. The last trolley ran in April of 1930 on the Commonwealth line. Seashore Trolley Museum has both a streetcar and bus from this railway. Car 41, 1901 John Stephenson Car Co. These items help fund this project. I will be doing an M & B talk for Lexington Historical Society and Waltham Historical Society. amazing photos donated to museum, M&B41 seashore's car as a diner in Natick, Ray's Lunch...awesome pics from the 20's and 30's. Years ago the Boston Street Ry. Assn. was supposed to publish a book on the M&B. From what I understood, the text had been done, or largely done, and photos had been collected. But then it mysteriously dropped out of sight. Does anyone know what happened to it, and whether this group is still serious about it? Don't hold your breath on the book. About seven years ago I helped with an aspect of the book (an M&B map), which was very close to publication. BSRA still advertises publication as a "coming soon" project. From what I heard, the project subsequently fell into editorial disarray....new info kept showing up and they didn't know when to shut it off, the original book was supposed to be mostly streetcars, but then a bus faction wanted buses up to MBTA times included (I think Motor Coach Age beat them to the punch), there were concerns that if buses weren't included, they wouldn't be many book sales because most of the trolley fans were dead or in rest homes and were unlikely to purchase a trolley book, the text got bogged down in details, the book as now envisioned maybe too pricey, etc., etc. The present excuses are..."well, you know this is just a volunteer effort".... I think you get the picture. BSRA has good intentions, the project is a work in progress, but I question the will to finish it in a timely fashion. Brad Clarke's recent BE book was supposed to raise funds to continue the M&B project. Well guess what... the book is due to come out this winter or spring...so Brad Clerke pulls it off. Amazing guy he is. I agree Brad is The Man as far as the BSRA is concerned. He advised me by e-mail this morning (9/26) that the M&B book is due out "maybe this Spring, more likely next Fall." As I said earlier, don't hold your breath, but we continue to hope for the best. Last weekend I oiled the journal boxes on this girl... now we just need to get people to help move the cars this fall. This was discussed earlier in this thread, but does anyone know the status of BSRA's perpetually promised, never appearing book in the M&B? I wish I could answer that since I am the project manager for the actual trolley...lol I hope it comes out someday... but if your ever in Maine let me know and I can show you both the streetcar & the bus from the M&B. I can speak to the status of the long promised book. What happened was that when the BSRA announced that the book was almost ready, there was an outpouring of new information and photographs that set the project back. Additionally the added material could make for a set of two or more volumes. This, coupled with a lack of Bradley's time has made the project take far longer than it should. When it comes out the book should be one of our finest, with lots of rare pictures. Since the trolleu era ended so early for the M&B, there is quite a large amount of bus material, up to the time the MBTA absorbed the operation in the 1970s. 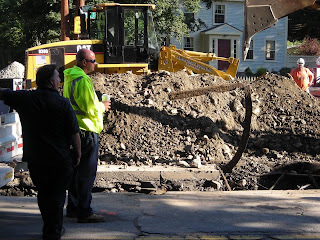 Woburn Street in Lexington, MA, is being excavated again this week. As I detoured around the work site yesterday, I saw rails in the trench that ran along the line of the street. This was at the crossing of the Minuteman Bikeway Rail Trail, but these tracks were at a large angle to the trail so weren't necessarily part of the old Boston & Maine line. I found in Wikipedia that the Middlesex & Boston Street Railway had a Lexington - Woburn line. Does anyone here know if that line ran along Woburn Street in Lexington? It's the obvious location, but not the only possibility. You can see some of the rail bent up by the excavator in this picture. There's another section in the shadow at lower right. You can reach a larger version of the photo through my blog at http://minutemantrail.blogspot.com/2008/08/old-tracks-on-woburn-street.html. Here's the M&B description of the Woburn - Lexington line. It does say via Woburn St.